Stop me if you’ve heard this joke before. The evolution of the Cygnus X-1 binary system. The top panel illustrates that the orbital period will shoot up in a few hundred thousand years, when the O star leaves the main sequence stage and enters the Hertzsprung Gap. Simultaneously, it will start losing mass very quickly (middle panel) and the black hole will grow (bottom panel). From Figure 2 of Belczynski et al. 2011. It’s funny, because the more wacky combinations of stars and compact object (white dwarf, neutron star, or black hole) we find or imagine, the more remarkable evolutionary scenarios astronomers can conceive of playing out. For example, if the system ejects material via a relativistic jet, we may observe it as a microquasar. If one of the companions goes supernova or if the pair merges, they could potentially explain all sorts of explosions that we see in the universe, including Type Ia supernovae. Such mergers might also be one of the most significant sources of gravitational radiation in the local universe. These authors investigate the fate of one such binary system: Cygnus X-1. Why look at Cygnus X-1? Cygnus (Cyg) X-1 contains the first black hole ever discovered (1972: Webster & Murdin, Bolton), confirmed when its ~20 M☉ O star companion was found to be orbiting a dark object with a dynamically-inferred mass of ~15 M☉. It’s also one of the brightest X-ray sources on the sky, which tells us that matter from the O star is falling onto the black hole and producing a super-heated accretion disk. The system became even more interesting a few months ago, when Reid et al. published an exquisitely accurate (~6%) distance to the system using trigonometric parralax and VLBA radio observations. 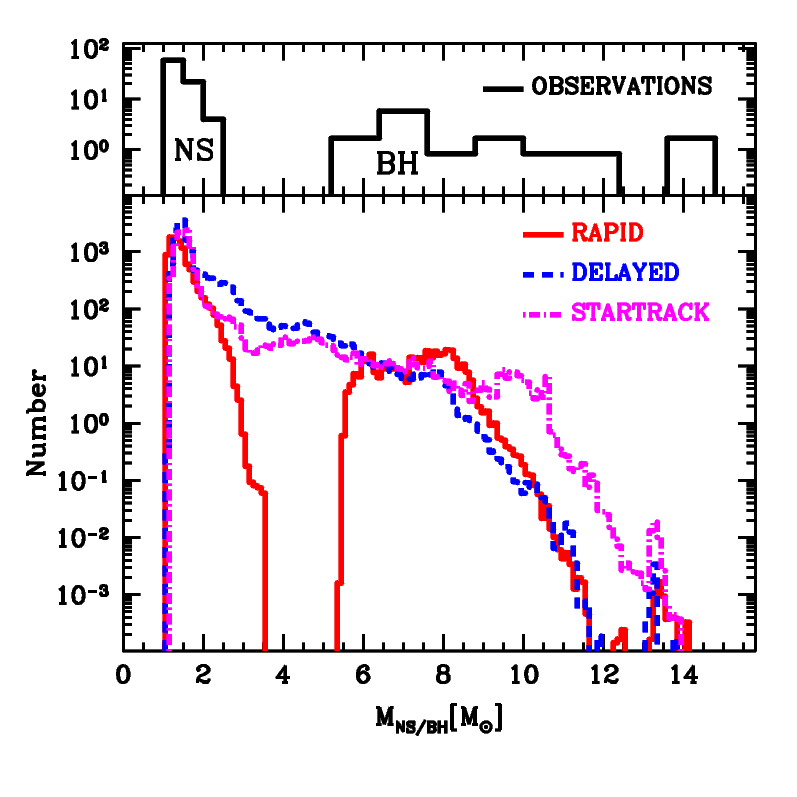 Knowing the distance allows us to infer the other parameters of the system (mass of the components, radius of the O star, and orbital period), with great accuracy (<10% error, Orosz et al. 2011). First, the authors discuss the potential future of the Cyg X-1 system. They use prescriptions for the evolution of binary star systems that are constructed from a variety of theoretical arguments and simulations in order to agree with observations. As it continues to lose mass to the black hole, they project that the O star will begin to overflow from its Roche lobe in just a few hundred thousand years. This implies that the system (which was probably formed ~10 million years ago) is essentially at the end of its life. Eventually, the O star will lose almost all of its outer H envelope, leaving it with not much beyond a small (~1 R☉, ~4 M☉) He core. Within a few millions years, the star will explode as a hydrogen-poor (Type Ibc) supernova, leaving behind a neutron star. The authors estimate that the system will probably (~74-94%) be disrupted by the explosion, and will cease to be gravitationally bound. However, there is a small chance (<1%) that the “kick” due to the explosion will be insignificant and the BH-NS binary will be left with an orbit so tight that tidal forces will cause them to inspiral and merge within a Hubble time (~13 Gyr). Given the fact that these systems only live ~10 Myr and that we only know of one Cyg X-1-like system in the Milky Way, the authors estimate that only a few (at most 14) such close BH-NS star systems could have formed in the history of our galaxy. That makes them about 1000 times more rare than NS-NS mergers! This implies that a gravitational wave detector such as Advanced LIGO or VIRGO would be lucky to observe a BH-NS merger once per century of operation. In other words, this one very specific progenitor scenario won’t be a major gravitational wave source. 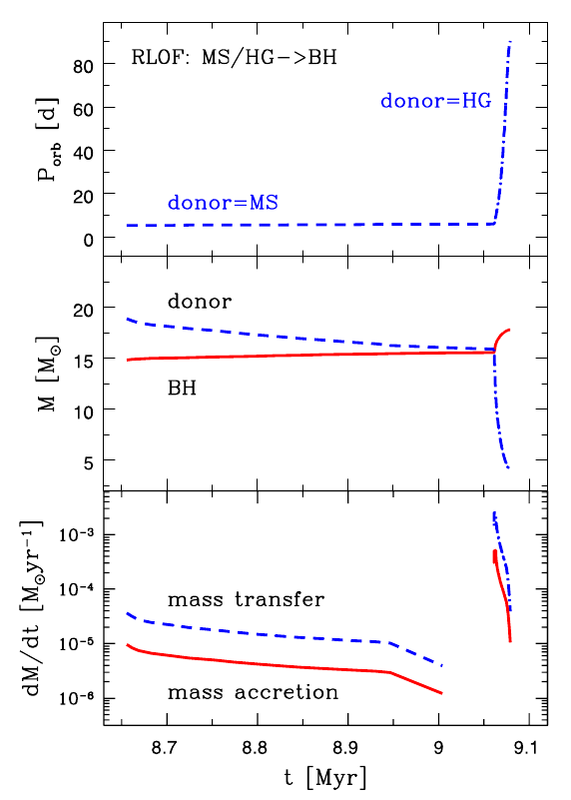 The authors test out one more scenario, where the O star never overflows its Roche lobe and therefore stays much closer to the black hole, increasing the chances that a close BH-NS binary is produced – but even then, the detection rate is only about once per decade.